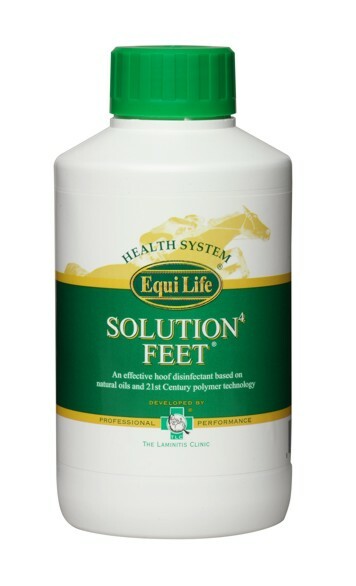 A brand new formulation, the Equi Life Solution Feet blends four highy potent active ingredients with proven disinfectant properties with natural oils, antioxidants and phospholipids to create a rapidly penetrating, effective hoof disinfectant. Below are some recent questions we've received regarding Equi Life Solution 4 Feet for Horses, including answers from our team. Would you use this on its own or with Solution 4 Feet Matrix for seedy toe? He's wearing shoes if that's relevant. This can be used on its own. The Matrix product is only used in cases where there are clefts or cavities in the hoof. It is used to pack these defects. The solution can be used as a general hoof disinfectant were needed. Will this help to clear up bad thrush? For severe thrush we'd recommend cleaning the affected hooves with Keratex Frog Disinfectant and then applying either a Silverfeet Hoof Balm (use twice daily) or a Kevin Bacon Hoof Solution (apply it five times day, every other day until the problem has been resolved). If you wanted to, you could combine the products eg some Keratex with the Silverfeet and apply this after cleansing. Both Silverfeet and Kevin Bacon can be used for maintaining hoof health year-round.